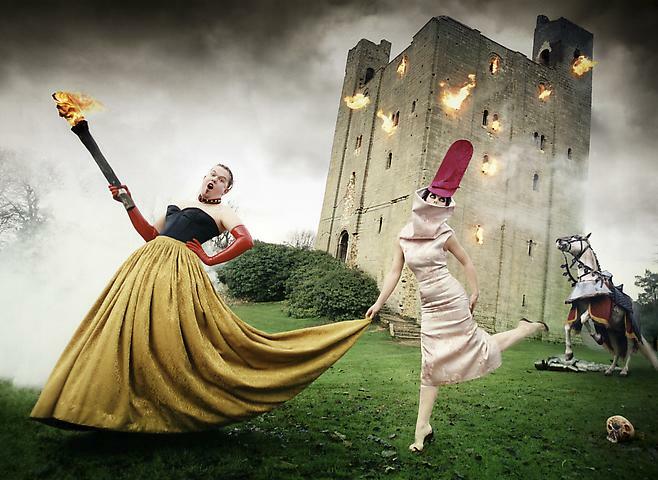 ‘Burning Down the House’, a portrait by David LaChapelle of the late Alexander McQueen and his ‘muse’ Isabella Blow has been acquired by the National Portrait Gallery. This is the first portrait by LaChapelle to enter the Gallery’s Collection and will be exhibited in the United Kingdom for the first time from Friday 14 October 2011.
dramatically burning in the background. Both were dressed in McQueen, with Blow also sporting a Philip Treacy hat, and the article named them ‘The Provocateurs’. At the time of the shoot McQueen was just 27 years old and had recently debuted his first couture collection for the House of Givenchy. Blow, 38 at the time of the shoot, was considered McQueen's muse.